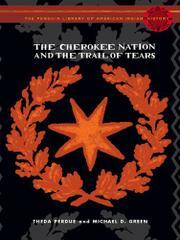 A brief account of the Cherokee people and its tragic encounters with European and American newcomers. One of the first volumes in the new Penguin Library of American Indian History, this study by Perdue and Green (both History/Univ. of North Carolina–Chapel Hill) sets the Trail of Tears removals of the 1830s in the context of a long history of conflict, alliance and failed treaties with the British crown and the U.S. government. The former regarded the Cherokees’ vast domain, which extended from north Georgia to Kentucky, as a resource to be used when the proper time came, believing “that Indian land fell far short of its potential productivity.” Even so, the British preferred the buffer zone that the Cherokees provided between their holdings and those of the French to any other gains, and so crown policy specifically forbade encroachment by land-hungry colonials. The American government had no such scruples; Thomas Jefferson, working from what he considered to be consistent Enlightenment principles, held that the Cherokees were capable of learning to be civilized—which meant going to work in factories, shopping at stores, incurring debt, etc.—and that selling their land to white settlers was the first step toward that end. “He ordered his agents to intensify the pressure on the tribes to sell more and larger tracts of land,” write the authors, “and he let it be known that threats, intimidation, and bribery were acceptable tactics to get the job done.” In the post–War of 1812 flush of newfound nationalism and the first formulation of Manifest Destiny, the Cherokee were pushed aside while their lands, increasingly, saw encroachment by farmers, miners and other white settlers. For their own good, supposedly, the Cherokees were finally marched off to reservations in eastern Oklahoma—removals that, the authors write, cost the Cherokee people thousands of dead and thousands more unborn. An illuminating history, devoted to an often overlooked and long-suffering people.